ET1 Enterprise Tablet - Powered for performance! The ET1 is a true enterprise-class tablet that you can deploy anywhere and offers everything you need — from security and durability to flexibility and manageability. With WLAN or WAN connectivity, you can count on the ET1 to deliver all the information your workforce needs to get the job done — whether they are inside the four walls or out in the field. On the outside, the ET1 is every bit as elegant as today’s most popular tablets. Yet the ET1 is built for everyday use, able to handle drops, spills, chilly winter temperatures, extreme heat and more. The display built with ultra-strong Gorilla® Glass is virtually impervious to damage and is able to flex when dropped without shattering or scratching. Whether your data resides on the internal drive or on removable media, it is encrypted, safe from hackers. So you can easily secure sensitive information, such as credit card data and patient information. With multi-user log-on, each worker is automatically granted access to their own personalized workspace — the right applications and device features. From retail to field sales and service, ET1 supports high-speed cellular/Wi-Fi wireless connections for greater productivity out in the field. 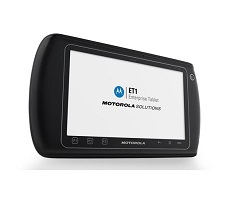 With Motorola’s RhoMobile Suite, you can easily create a single application that looks, feels and acts the same on Motorola mobile computers, regardless of whether it is built on the Android, Microsoft Windows Mobile or Windows CE operating system, reducing application development and support costs.